I was most intrigued by and ultimately inspired by Kordell’s graphical facilitation skills. He was able to listen to our responses and capture not only the words but also the context, emotion and impact of what we were saying in a way that documented the whole response. "Kordell stretches your brain! We learned amazingly creative ways to visualize organizational goals and how to align our team with those objectives." "When Kordell enters a room he brings warmth, energy and joie de vivre. His confidence is infectious and infuses the environment with a spirit that is difficult to ignore. A thinker and perhaps a Renaissance man—he makes reinvention look easy! With business savvy built around his breadth of knowledge, experience, and sound business processes, infuse his penchant for collaboration and his giving nature are core strategies as well. " "I really did not believe that Strategic Planning and Visioning could be this interesting and fun"
"Kordell's workshop . . . Educational! Humorous! Helpful! Humbling! Very worth the time!" 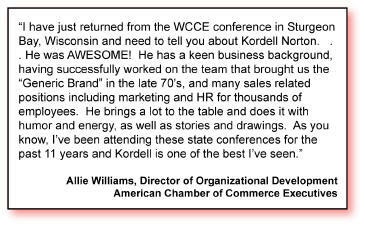 “I was concerned about giving up a weekend day to have my folks attend Kordell’s workshop. Totally worth it. I would recommend him to anyone." 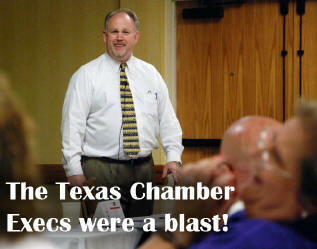 "Thought you would like to know the feedback I got from my fellow Rotary members after your presentation to our group. It was basically twofold . . .
1) Good Program with an energetic speaker covering an interesting topic and. . .
". . . . I will go to any class or meeting that he would be involved in." "Just wanted to thank you again for talking to the kids. They have left up the papers from your presentation so they can see them everyday. You could not have done a better job and I really believe you struck a chord with the kids. Thanks Again!!!" Evaluation responses from some recent workshops . . . . The following are comments taken from evaluation sheets from various workshops, seminars and speaking engagements. You can tell by the responses that different materials were used in these programs. Kordell wants to give you more of these. . . .but there is such a thing as overkill. What did you like most about this session? What is the most useful idea you generated as a result of this workshop? Visual Aids. 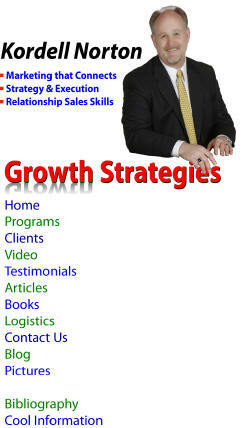 A new way at looking at the products and services that I offer. It helped me think about describing the current market place trends. Kordell was very entertaining. Wasn’t boring at all. The brainstorming ideas were very helpful. We all need to take more time to listen. It was very interesting. The speaker was energetic, happy and very animated. Would have like to have more time. Great Facilitator. Visuals and colors – best I’ve seen. Felt like we finally accomplished something. This is the most I’ve ever gotten out one of these planning sessions. I greatly enjoyed the charts that were used. I feel everyone came to a consensus that the staff needs to be informed of what each needs and wants, before implementing a project. Style-Delivery. Liked the info shared. Instruction on how to work together as a team. The opportunity of listening and exchanging ideas of where to start this process. That as a group we need to understand what the end result will be. We need more group time to incorporate and discuss. Too much information and ideas to do in such a short time. . . but we had a good start. The way you tied concepts into business. Very well put together. The most useful idea is ways to integrate sensory experience to improve results. The Brainstorming session was helpful. How to look at our senses was helpful. I wish you had time to add information about how we as an individual can increase sales growth separate from the corporation. What points will you most likely use when you return to work? Because I work in such a competitive market at a realtor . . . I will NOT be sharing too much of your valuable information with others. I mean. . .why make competition harder? Good stuff. “We have to remember to work together as a team and we should set procedures (with staff input) and follow them”. I like your reminder on the customer experience, the attention to providing optimal experience of service. Looking for the unique factor, the need for brainstorming and multimedia. Constant brainstorming to bring up new ideas as well as team building. How did Kordell do? Any comments or insights? I like the way he went from group to group to us on task – made us think for ourselves. He did great. He helped keep the large group on task. Was very informative, positive & energetic. Great! Awesome speaker. I think he was able to help a few understand better. Great! We’re a tough group. He pulled us together well. Good at helping clarify and focus the group. Very energetic about his topic. He definitely keeps the audience awake! Excellent. He forced us to narrow our topics and be more specific. Great personality and attitude. Did what he was hired to do. And from the EnterpriseOhio Network Conference of 2005. . .